The collision happened on Newbridge Bank on the A183 Chester Road. Image copyright Google Maps. A collision involving four cars caused disruption on a busy road of the A1(M). 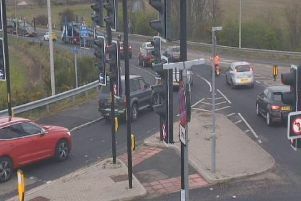 The crash on Newbridge Bank, on the A183 Chester Road from the A1(M) at Chester-le-Street to Lambton Park and Houghton Gate, happened near to a road works which have been set up on the route. Minor injuries were sustained in the crash, with County Durham and Darlington Fire and Rescue's crew from High Handenhold Fire Station offering those involved first aid. The officers ensured the vehicles were made safe as the scene was cleared. The incident happened at 6pm yesterday.